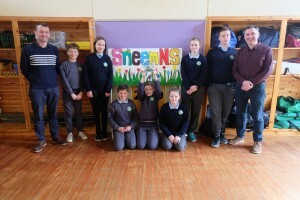 Kenmare News | St. Michael’s students are winners! St. Michael’s students are winners! National School, Sneem, were winners of the Primary Schools category in the VEX IQ ROBOTICS recently held in IT Tralee, overcoming a field of 20 primary schools from all over the county. Points were awarded for driving skills, placing hubs in scoring zones and autonomously programming their robot. Pictured receiving their award are teacher Mike Hussey, Sean O’Sullivan, Dearbhla O’Sullivan, Robert O’Donovan, Sive O’Leary, Leona Rigter, Lucy Burton, Kacper Domanski, with John Walsh from Tralee IT.